"Bhanwar Niwas, belonging to the Rampuria Family, was constructed in 1927 for Bhanwarlal ji Rampuria. 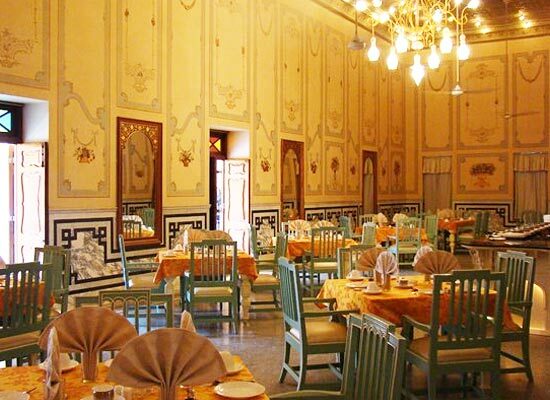 One of the most popular heritage hotels of Bikaner, this mansion has an elegant decor of the 1920s and modern comforts have been added to suit the taste of the modern guests. This mansion is a wonderful mix of Indian and European styles of architecture. The staff is known for offering flawless hospitality services. The rooms of the property are well-equipped. Savor lip-smacking vegetarian delicacies during your stay. 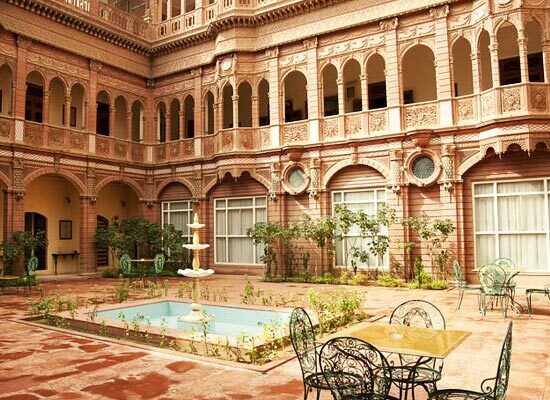 This imposing Haveli is a living testimony to the splendid architecture of Rajasthan. This heritage hotel is a perfect blend of Indian and European style. A proof of the workmanship of the artisans of Bikaner, the palace was completed in 1927. It was built for Bhanwarlalji Rampuria, heir to a textile and real estate fortune of the region. 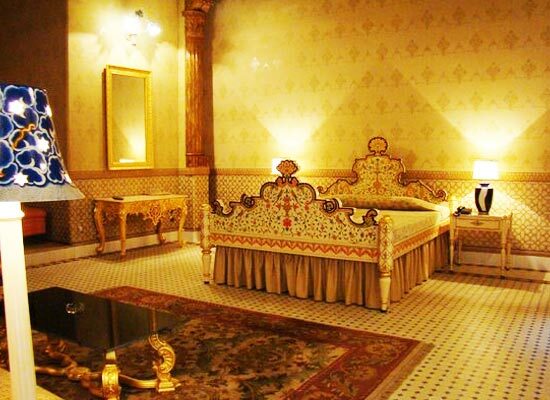 One of the most stunning havelis of Bikaner, it belongs to the Rampuria family. The décor has 1920s feel and elegance, which has now been clubbed with contemporary comforts. 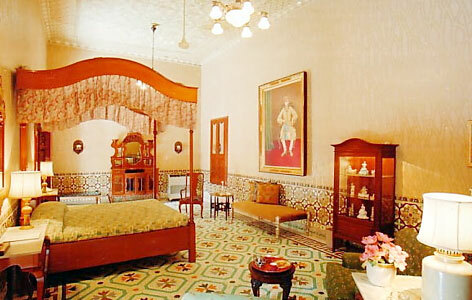 Accommodation at Bhanwar Niwas comprises of 25 guestrooms wherein 11 are deluxe rooms. Each room is different from the other. The décor of the rooms is warm and inviting. All the rooms are very well-equipped with all the modern comforts such as air-conditioner, attached bathroom, four-poster bed, side lamps, television with satellite connection and so on. 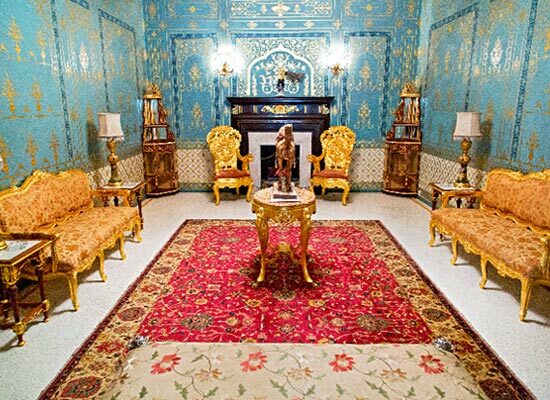 The Public rooms are located on the ground floor and these include the Little Drawing Room, and the Blue Drawing Room. At the on-site restaurant (Dining Hall), the resident guests can savor sumptuous delectable vegetarian food, prepared by the trailed chef using aromatic spices, and freshest of ingredients. Tourist information desk and sight seeing arrangement. Cable / satellite TV with all major channels. Bikaner is situated at some elevation from the ground level. The whole city of Bikaner is surrounded by a walled fort which has five entrances. You can enter from any one of these gates. This ancient town lies on the North Western fringe of Rajasthan and attracts a large number of tourists every year. The city abounds in architectural splendor – the many sandstone palaces and forts bears a living testimony to this fact. The best time to visit Bikaner is from October to March.